The outlook concerning the occurrence of industrial accidents has led to the implementation of response systems based on geoprocessing tools, which are widely adopted in emergency for such ventures, since they have helped and served as a support for decision making, as well as for the preparation of guidelines aimed at managing emergencies. Nuclear power plants, because they constitute types of industrial activities that present dangerous conditions and attention regarding security are characterized as hazardous, especially due to consequences that occurred from large accidents— such as Chernobyl (1986) and Fukushima (2011)—highlighting the importance to its negative impacts, since the occurrence of accidents at nuclear power plants may affect surrounding areas, thus exposing a set of elements that are part of the environmental dynamics that integrates the catchment area where this type of plant is situated. In this way, through an integrated view of the region where the nuclear complex is located in Angra dos Reis City (Rio de Janeiro State) and, also, by aggregating information that portray the geobiophysical reality of its surroundings, several elements were incorporated into a database developed in a virtual environment, in which was produced a geographic information system (GIS) that presents a complex of variables that, once considered, can enhance various analysis in order to support emergency situations and planning, as well as guidelines that help define actions from the occurrence of accidental events at the nuclear plant. In recent years, the areas of accident prevention and emergency response planning have become controversial issues, due to the occurrence of large accidents with variable spatial distribution . Because of accidents in the industry generally and particularly in the nuclear industry, the security issue began to attract attention, overall because of the fragility that such ventures demonstrate when the causes and key consequences generated as a whole to the environment-society and its vicinity are analyzed in depth, including environmental and socioeconomic aspects, and therefore considered vulnerable to accidents. In this sense, the occurrence of accidents motivated international organizations to develop guidelines, recommendations and legal requirements for planning emergency control in industries, which resulted in the creation of a variety of emergency response systems. Nowadays, several resources with strong computational basis have been used as support and assistance in decision making for emergency planning and, in recent years, systems of application of programs have emerged that integrate a diverse database and information related to industrial accidents. observed that some of these systems are made by different database and software applications that allow access, store and evaluate information for development of emergency plans. • capable of logging and tracing activities and resources, which is important not only during a real emergency, but also as a training tool. The nuclear sector, because it constitutes an activity that offers even greater risks due to radioactive material that might be released from the occurrence of an accidental event, constitutes an industrial venture which were target to rigid rules, applied especially after the Chernobyl accident, with the mandatory implementation of emergency planning and response systems, especially incurporating geoprocessing technologies, particularly by the scope of the serious consequences and risks that such accidents can provide to the geographic space situated in the vicinity of these ventures. Considering these characteristics for this type of enterprise, it is important that that the response systems integrate tools of support that incorporate a diversity of data, in which may represent in its totality the environment in which nuclear ventures are installed. Studies such as [3-10] corroborate with the idea that in industrial areas there is a need to provide a set of data and elements that, beyond representing the existing dynamic space, also contributes to generate a geographic database, since the available information and general knowledge about the environment surrounding the Industrial venture are basic requirements that help subsidize and define answers to procedures and emergency situations. 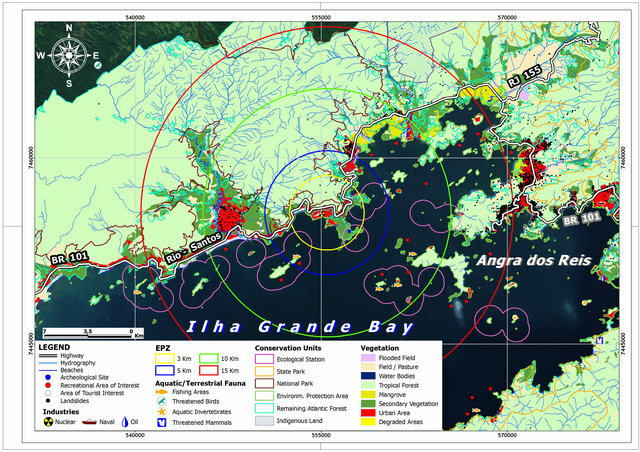 Evaluating the geographic space in Angra dos Reis Nuclear Complex (Rio de Janeiro State), the objectives of this study are: elaboration of a GIS as a tool of of support aiming at planning and emergency situations in the area of influence of nuclear plants, incorporating information of geographic nature, geological, meteorological and other geobiological physiographic characteristics that compose the environment of study; furthermore, through an integrated special analysis from GIS, identify aspects and vulnerable areas in order to assist in the process of emergency and its planning. This study was evolved in Angra dos Reis City situated in the southern region of Rio de Janeiro State in Brazil (Figure 1), where the “Central Nuclear Almirante Álvaro Alberto” (CNAAA) is located, formed by the group of nuclear plants “Angra 1, Angra 2 and Angra 3” (under construction). The region as a whole has a population around 174,000 inhabitants and a complex geobiological physiographic configuration, where geographical, geological, meteorological and socioeconomic aspects are highlighted, which integrates local environmental dynamics and give the area specific singularities. Considering the various spatial elements that comprise the local landscape, this region constitutes an intricate environment in relation to its spatial dynamics that, by the complexity of its aspects and by projecting emergency situations from an accidental event in the set of nuclear plants, composes in its coverage area a critical framework in relation to the impacts that may occur. The combination of many factors, such as rainfall and the occurrence of landslides, for example, together with the distribution of population in many areas considered at risk, contributes to characterize critical points that, when integrated into an existent geobiological physiographic set, constitute important aspects that need to be analyzed in the case of emergency situations, as well as in planning emergency response from an accident in the nuclear complex, especially in the evacuation process, as well as in relation to the impact that such an event may result in the environmental dynamics in its area of influence. Initially, in order to contribute to the analysis of impacts in case of an accidental release of radionuclides from the CNAAA, socioenvironmental data were identified and acquired in order to characterize the geobiological physiographic reality of the study area. A second step consisted in assimilating these data in a GIS platform, through ArcGIS 9.3.1 system, where much of the information were georeferenced and transformed to the format “.shp”. Much of the information of interest are available at government agencies and are shared online, where they were systematically acquired and suited. Finally, in order to make an integrated analysis of potential impacts in the study area, the main aspects considered essential for incorporation were listed: distribution of population, location of water bodies and catchment points for supplying the population, the main escape routes, fishing locations, location of conservation areas, location of residential areas, location of points of tourist interest, among others. Seasonal and daily weather conditions in the region, as well as information on the main landslide areas were unfailingly contemplated. Figure 1. Situation map of the study area. hia de Pesquisas e Recursos Minerais (CPRM)—Company Research and Mineral Resources, Department of Civil Defense of Angra dos Reis, ELETROBRAS ELETRONUCLEAR (Company owns CNAAA), Instituto Brasileiro de Meio Ambiente (IBAMA)—Brazilian Institute of Environment—and Instituto Chico Mendes de Conservação da Biodiversidade (ICMBIO)—Chico Mendes Institute for Biodiversity Conservation. The geographic information composite system is considered specific to the study area, as well as to nuclear and industrial ventures in Brazil, especially because of the importance of the nuclear complex and its possible out comes in case of occurrence of an accidental event, constituting an instrument that enhances the integrated spatial analysis and serving as a support for decision making, in addition to supporting emergency situations, as well as environmental and urban planning and management. 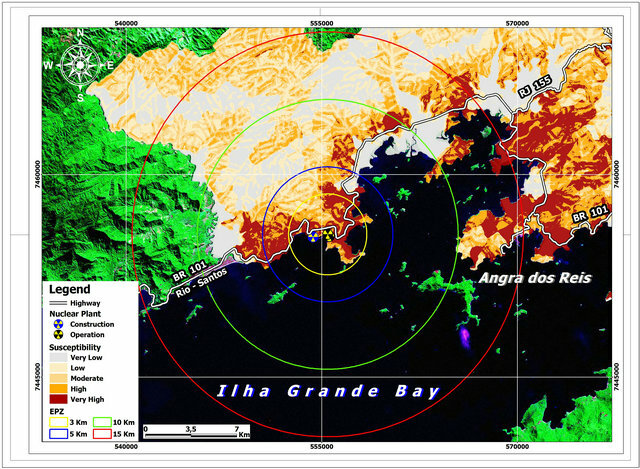 Considering such perspective, the development of this system incorporates data representing environmental dynamics of the area of influence of the nuclear power plants of Angra dos Reis, and in this sense, covered the main geobiological physiographic aspects evaluated as important as information to be analyzed both in planning and in emergency situations. In this way, Figure 2 shows the basic idea and main components considered in the GIS structure developed. The region has a geomorphological setting that through geological time, characterized the formation of peninsulas and bays, mountains and rocky shores. The Atlantic Rainforest is its dominant landscape, especially in view of the formation of the relief, formed by high sloping hills that dominate the landscape. CNAAA is situated in the bottom of a bay, surrounded by high mountains and hills with steep slopes. Figure 2. Data structure contemplated in GIS for the study area. accentuated, especially during the summer (between the months of November to March), as observed [11,12]. The region of Angra dos Reis has a meteorology complex, mainly due to its geomorphological setting that contributes to the climatological diversity of the entire area. The main aspects that characterize the local weather are key to the application of specific models, particularly with respect to the dispersion of pollutants, from which it is important to have knowledge of: atmospheric stability, direction and intensity of prevailing winds. points out that there are strong indications that sea breezes interact with the mountain ranges, causing local circulation, and that the proximity to the ocean, the topography and the strong insolation make the wind regime very unstable and weak. For the analysis of the meteorological characterization of the region was prepared winds rose, indicating the variation of intensity and wind direction within a daily and seasonal cycle, besides showing the periods of calm and the behavior of the region with respect to atmospheric stability classes for different seasons of the year and times of day. Precipitation data were obtained from the work of  that, by using a series of pluviometric measures of 25 years (1980-2004), Table 1, made a diagnosis of the average climatological precipitation in the region. Therefore, by the evidence of this work, the months of greater precipitation are January, February, March and December. Table 1. Precipitation data—period of 1980-2004—in the surroundings of CNAAA. Adapted from . 1987) present values of approximately 100 mm. That is, the region under study is characterized by high density rainfall. 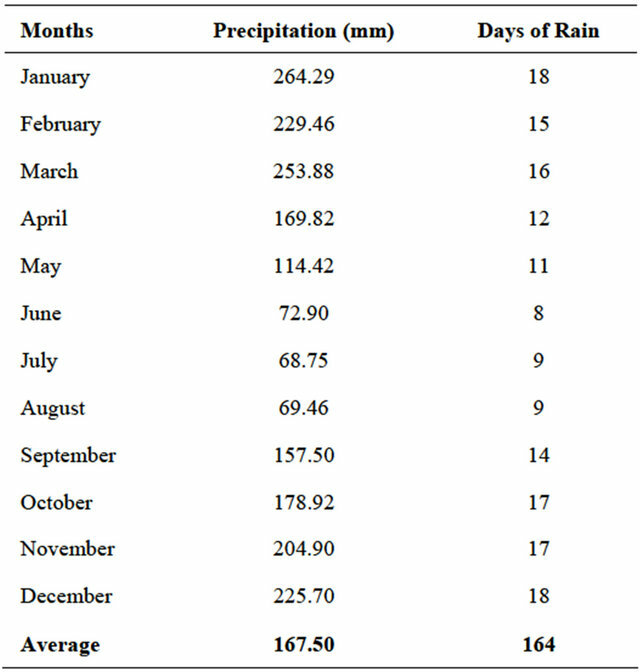 also emphasized that in the region occurs, on average, 158 days of rain per year, with monthly averages above 70 mm. Due to the steep slopes, as well as the assets of geodynamic processes and heavy rains, many parts of this region are particularly susceptible to landslides (Figure 3). Figure 3. Susceptibility to landslides in the study area. Source: . naturally high susceptibility of the region in face of the dynamic slope processes. The region consists of several protected areas (Figure 4) that spread throughout its coastal zone, featuring an environmental framework with important ecosystems that serve to maintain biodiversity, conservation and presservation of the remaining forest and wildlife that inhabit or attend this geographical space. The conservation areas in general, besides being protected by federal, state and local laws, are of great ecological importance, whether or not covered by native vegetation and whose function is to preserve the water resources, the landscape, the geological stability, the biodiversity, the flux of fauna and flora, soil protection and ensure the well being of human populations, such as: spring areas, salt marshes and vegetation located along rivers. considers that there is a wide variety of types of protected land for environmental reasons, which include, in addition to national parks, biological reserves, national forests, game parks, ecological reserves, areas of ecological interest, ecological stations, environmental protection areas, areas of tourist interest, protected forests of the union, among many others. The region, according to , because of its high diversity and high number of endemic and/or endangered species, is included in one of the Brazilian centers of plant diversity recognized by WWF—World Wildlife Fund for Nature and IUCN—The World Conservation Union . The CNAAA is situated in a region dominated by tropical forest (also known as the Atlantic Forest), whose name is “Mata Atlântica”, biome that covers diverse backgrounds. The state of conservation of the forests varies widely with the mountainous stretches being better preserved and the portions located at sea level being decharacterized and replaced by various systems of occupation over time. Angra dos Reis, according to , (69,664 ha), is the second largest area of remaining native vegetation (69,664 ha), covering 87.98% of its length. The whole area of influence of the project is included in the spatial distribution of the Atlantic Forest, called Dense Ombrophylous Forest. As well, prevails the submontane forest and montane forest. Associated ecosystems, such as mangroves, salt marshes and rocky shores are found  (Figure 4). The remaining forests that still exist, according to , are generally in areas where the terrain hampers access and or exploitation in Units of fauna,  identified four ichthyographic sites that conservation, whether private or federal. The same situation is observed also in their associated ecosystems. Therefore, the region of “Costa Verde” signifies one of the largest representative nuclei of the Atlantic Forest that persist throughout the state of Rio de Janeiro. Whereas this region remains ecosystems with lower occurrence, at different levels of preservation, beyond the forest itself, such as mangroves and salt marshes. According to , the terrestrial fauna of the region is formed basically by herpetofauna (amphibians and reptiles), avifauna (birds) and mammals (mammals in general, highlighting: bats and rodents). Over the aquatic fauna,  pointed out that, as a result of seasonal variations in marine environmental conditions in southern Brazil, spatial and temporal oscillations occur in the distribution and abundance of living marine resources in the region. In this regard, according to , it predominates in the region mammals (turtles: sea turtles and; cetaceans: whales, dolphins and porpoises). 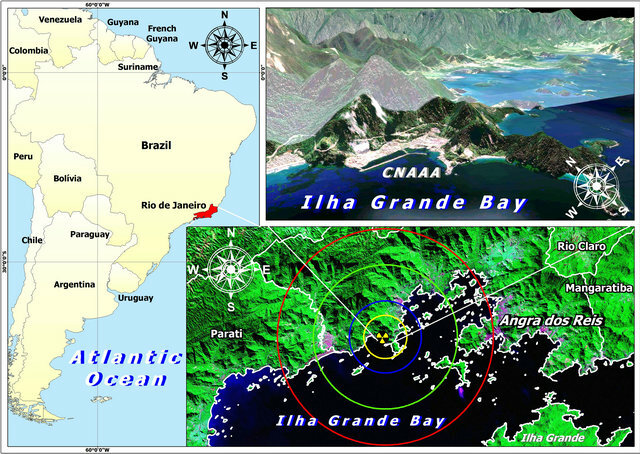 Regarding the ichthyofauna,  identified four ichthyographic sites that that represent the main biotopes of “Ilha Grande” Bay: units of “Sabacú—Porcos—Abraão” (the bottom of the bay ecosystems) and; “Drago—Grego” (open environments, typically ocean) and; “Coronel” (area of bedrock) and “Acaia” (mouth of the bay, with sandy bottom and intermediate characteristics between the internal and external sectors). There were at the time 25 groups of economically exploited fish in the bay, among which stand out stingrays, goete, flounder, hake and croaker, which in 1993 amounted to 86.9% of total catches. registers zooplanktons, ichthyoplanktons, zoobenthos, terrestrial and aquatic macroinvertebrates (Decapoda: 9 spp; Ephemeroptera: 5 spp. ; Odonata: 36 spp. ; Hemiptera: 19 spp. ; Homoptera: 11 spp. ; Coleoptera: 45 spp. ; Hymenoptera: 5 spp. ; Mecoptera: 1 sp. ; Trichoptera: 26 spp. ; Lepidoptera: 15 spp. e Diptera: 70 spp. ), besides the encrusting fauna (groups of animals and plants grown on artificial substrates immersed in sea water) occurring across the region. Its importance in local ecosystems is directly linked to the food chain that supplies the natural cycle of existing species. 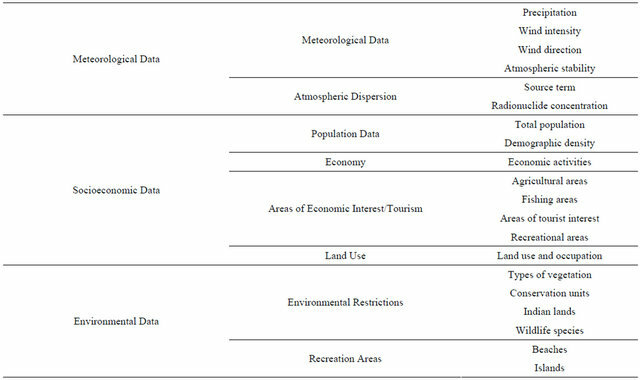 Figure 4 spatializes some of the aquatic and terrestrial species in the region. The Hydrographic Region of “Ilha Grande” Bay (HRIGB), supplied by small watersheds, has 1800 km2 and is located in the southern state of Rio de Janeiro, encompassing the cities of Angra dos Reis and Parati. In “Planalto da Bocaina”, in the north, spring the two major river basins in the region: Mambucaba (740 km2) and Bracuí (185 km2), in the municipalities of Cunha, São José do Barreiro and Bananal. “Ilha Grande” Bay, in the south, receives the rivers that drain its entire length. evaluated that the main use of water in the region is for urban water supply, made by numerous catchments in small watersheds. The supply serves about 180,000 inhabitants, but during holidays and long weekends this demand increases because the population swells with the influx of tourists. The total water demand of HRIGB continental range is 66,000 m3/day, considering the maximum demand related to the peak from tourist inflow. The demand per capita is 470 L/inhabitant day, included therein the consumption of the main economic activities. The greater use corresponds to the resident population with 35,000 m3/day, representing 53% of the total, followed by the floating population, with 24,000 m3/day and 36% of total demand. The four largest economic enterprises located in region—shipyard BRASFELS, terminal TEBIG of Petrobras, nuclear power plants Angra I and II and the harbor of Angra dos Reis, consume 7600 m3/day, which represents 11% of the total. Analyzing the hydrogeological favorability of the region, the EIA (Environmental Impact Assessment) of Angra III highlighted that the area is characterized by steep slopes, where the system composed by covers and crystalline rocks discharges its waters in the river valleys and drainage sites, being of extreme importance to their background regimen. also emphasizes that the water supply in the city of “Angra dos Reis” is made up of 56 catchment systems, mostly situated in the upper course and/or near the headwaters of small rivers, in which were constructed small dams and “reservoirs”, whose captured water is treated and distributed. The main economical activities developed in the region are based specially upon the industrial sector, tourism, fisheries, commerce and services. According to information from the Brazilian Trade Balance by Municipality, of the Ministry of Development, Industry and Commerce —MDIC, Angra dos Reis is among the municipalities that recorded the highest volume of exports in the first quarter of 2012, a total of (US$2958 billion), accompanied by São Paulo-SP (US$1997 billion), Rio de Janeiro-RJ (US$1901 billion), Parauapebas-PA (US$1781 billion) and Paranaguá, PR (US$1242 billion). According to these data, Angra dos Reis also had the largest monthly trade surplus accumulated so far in 2012, with US$2606 billion, followed by Parauapebas, PA (US$1678 billion), Anchieta, ES (US$ 8337 million), Nova Lima, MG (US$8323 million) and Santos, SP (US$8253 million). Nowadays, the local economy presents important investments in the naval sector, energy sector and tourism, attracting migration from the metropolitan area and other cities of Rio de Janeiro State. In accordance with , other activities have their importance and compose the economic picture of the city. Among them stands out the sector of commerce, services, agriculture and other industrial activities, which are presented in Table 2. The city of Angra dos Reis, according to the Census of 2010 , had a population of 169,270 inhabitants—Table 3, that corresponded to 69.7% of total residents in the region of Costa Verde Bay, in the State of Rio de Janeiro. A count made by IBGE in 2011 pointed a number of inhabitants around 174,000 residents, setting a growth rate in the order of 3% per year. 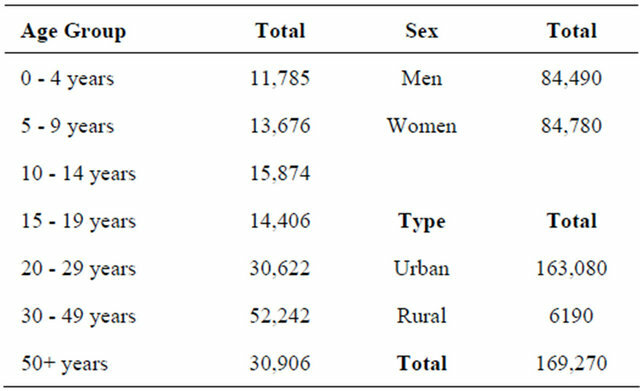 The data in Table 3 shows that the population is predominantly urban, with a ratio of female to male equivalent to 99.66 men per 100 women. In terms of age, the majority of the population is aged between 30 and 49 years, followed by the age of 50 years or more. The population density evaluated for the period was 205.4 inhab itants per km2. Table 2. Number of establishment by size and sector of production for the year of 2010. Table 3. Population dynamics of Angra dos Reis. gram ArcGIS 9.3.1, which allowed the preparation of a georeferenced database that covers all attributes that characterize geobiophysiographic aspects in the study area shown in Table 4. Furthermore, a set of maps were produced, in which they present the intersections between the various elements that comprise the geoenvironmental system of the area of influence in the CNAAA and the municipality of Angra dos Reis. This set of maps, however, were integrated into a single map—represented in Figure 4—as a way to demonstrate the complexity of the area as a whole. Additionally, we included the emergency planning zones (EPZ), which characterize the areas possibly affected and to be evacuated via an accidental event in the plants. 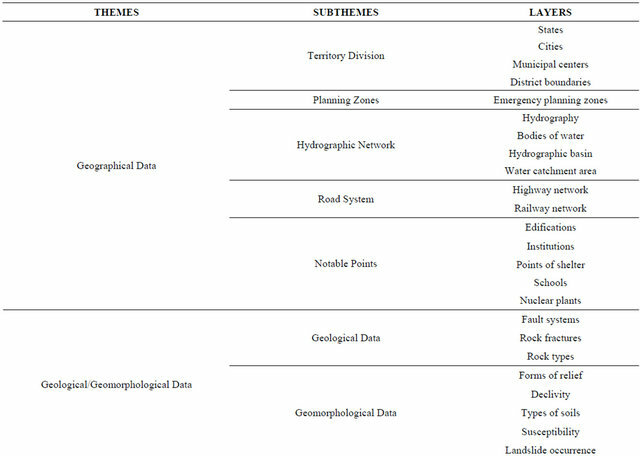 The following Table 4 presents the structure of the data and information included in the GIS, which will serve as elements to make complex spatial analysis in order to determine and develop specific scenarios, as well as geoenvironmental guidelines to assist in planning and in emergency situations. The set of information in the study were considered essential in order to assess the environmental framework of the whole area and link them to possible consequences from an accidental event through the dispersion of radionuclides. In this sense, we discus below a brief analysis on the importance of such data in emergency situations and in its planning. Meteorological data constituted an important information towards the development of prospective scenarios, because of its daily and seasonal information; it can be integrated with data from landslides and concentration, which features from the GIS base, a powerful tool for analyzing escape routes and emergency situations. The relevance of rainfall data are fundamental in order to analyze the occurrence of integrated natural phenomena (precipitation and landslide) along with an accidental event from the nuclear complex as well as to tourist flow in the region, road traffic, and other elements of equal complexity. Figure 4. Geobiophysiographic diversity in the study area. Table 4. Relation of data and information that compose the georeferenced database of the study area. chain which is linked, and therefore dependent on each other, and which certainly has an effect in humans. With regard to water resources, examining such issues and relating them to a possible accident scenario in the region, we must consider several aspects of the interaction, which can characterize a critical framework, both on water bodies as on the population. If we take into account that the region as a whole has high rates of rainfall and that these naturally seep into rivers, where the water catchment for supplying the population is made, a contamination of the entire system by radionuclides emission could lead to catastrophic consequences for the population-water resources set and, so forth, requires urgent need of monitoring the emissions of radioactive material and water quality, especially in the existing emergency planning zones. Considering the spatial distribution of economic activities in the territory, tourism is the activity that most mobilizes people throughout the coverage area of the municipality, since the natural attributes—beaches, islands, diving practices, among other derivatives—attract a population contingent to visit these places. It is worth remembering that this activity is responsible for an increase in population as well as an increment in service demands in different seasons, especially in summer. This fact becomes essential and should also be considered in the event of an accident and in the evacuation process because, taking into consideration that virtually all escape routes are concentrated along the highway, the flow of a population that does not know the city and its geography is a factor that can complicate the planning of emergency, lacking other alternatives for the evacuation besides those which already exist. In relation to population distribution, areas situated near the nuclear power plant constitute a considerable density in number of inhabitants, which is a major factor in the evacuation process and should be considered in emergency situations and planning, since the withdrawal of these people, could hamper emergency situations, especially due to panic among residents. Moreover, as the only access is the highway, the amount of people that will concentrate near the highway can become a complex aspect that needs to be examined in all their points of view. This study showed that the region as a whole has great complexity in its spatial distribution. This factor should be considered in emergency situations and planning, especially in view of the nuclear complex of Angra dos Reis and the possible impacts that may result from an accidental event, through the emission of radionuclides. 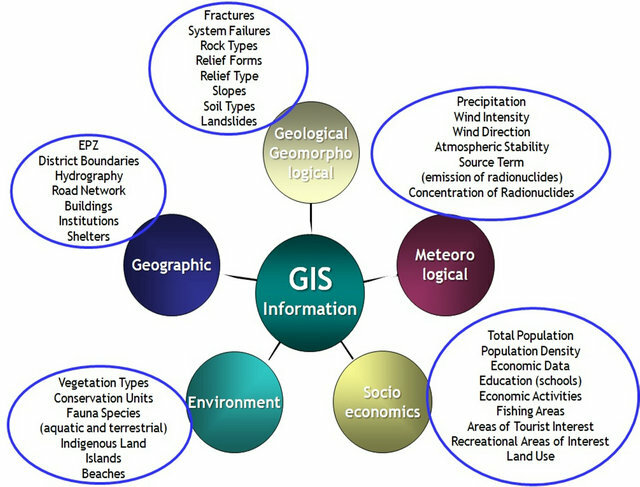 Thus, the development of a GIS that incorporates representative elements and creates a geographic database on the geobiological physiographic dynamics of the whole area of influence of the project constitutes an important tool that, in addition to potentiating complex spatial analyzes, should contribute to the decision-making process. Moreover, the efforts to contemplate a database over the study area in a GIS platform that serves as an analysis for an issue so complex as the installation of a nuclear power plant in an environment full of complexities in geographical, geological, climatological environmental and socioeconomic terms, may serve as a basis for also being implemented and applied in areas that keep the same similarities, especially considering the expansion of nuclear power stations in Brazil. Other aspects, such as the calculation of the source term (used in the simulation of radionuclide dispersion based on meteorological), land use, agricultural areas, water catchment area, highway traffic and population distribution by geographic regions-districts) are likely to have a significant impact due to the emission of radionuclides and are equally important of being associated to the base GIS presented here. Their results and other interpretive analysis will be discussed in a later article. The writers would like to acknowledge the financial support of the Comissão Nacional de Energia Nuclear (CNEN)—National Commission for Nuclear Energy. The authors would like to thank the Department of Civil Defense of Angra dos Reis for the data over landslide occurrence. We also thank the FAPERJ. The writers are also grateful to the contributions of the editors and reviewers. E. E. R. Russo, “Um Metamodelo para Configuração de Espaços de Trabalho Virtuais Colaborativos: Aplicação no Gerenciamento de Desastres de Estruturas Offshore de Óleo e Gás,” Pontifícia Universidade Católica, Rio de Janeiro, 2006. S. Contini, F. Bellezza, M. D. Christou and C. Kirchsteiger, “The Use of Geographic Information Systems in Major Accident Risk Assessment and Management,” Journal of Hazardous Materials, Vol. 78, No. 1-3, 2000, pp. 223-245. C. T. Kiranoudis, S. P. Kourniotis, M. Christolis, N. C. Markatos, K. G. Zografosb, I. M. Giannoulib, K. N. Androutsopoulosb, I. Ziomasc, E. Kosmidisc, P. Simeonidisc and N. Poupkou, “An Operational Centre for Managing Major Chemical Industrial Accidents,” Journal of Hazardous Materials, Vol. 89, No. 2-3, 2002, pp. 141-161. S. Girgin, K. Unlu and U. Yetis, “Use of GIS as a Supporting Tool for Environmental Risk Assessment and Emergency Response Plans. Comparative Risk Assessment and Environmental Decision Making,” Kluwer Academic Publishers, Dordrecht, 2004. R. Rota, S. Caragliano, M. Scaioni and F. Ravasi, “EPM: A GIS-Based tool for Emergency Preparedness and Management of Industrial-Related Accidents,” Chemical Engineering Transactions, Vol. 13, 2008, pp. 437-444. T. Elbir, N. Mangir, M. Kara, S. Simsir, T. Eren and S. Ozdemir, “Development of a GIS-Based Decision Support System for Urban Air Quality Management in the City of Istanbul,” Atmospheric Environment, Vol. 44, No. 4, 2010, pp. 441-454. E. P. Soares, “Caracterização da Precipitação na Região de Angra dos Reis e a Sua Relação Com a Ocorrência de Deslizamentos de Encostas,” Universidade Federal do Rio de Janeiro, Rio de Janeiro, 2006. J. F. de. Oliveira Jr., “Estudo da Camada Limite Atmosférica na Região de Angra dos Reis Através do Modelo de Mesoescala MM5 e Dados Observacionais,” Universidade Federal do Rio de Janeiro, Rio de Janeiro, 2008. J. Pimentel, “Projeto áreas de Risco na Região de Angra dos Reis, RJ: Modelagem Espacial de Dados em SIG Para a Geração de Mapa Previsional de Áreas de Risco Geológico,” Korea Institute of Geosciences and Mineral Resources, Daejeon, 2010. MRS Estudos Ambientais Ltda, “Estudo de Impacto Ambiental da Unidade 3 da Central Nuclear Almirante Álvaro Alberto,” MRS Estudos Ambientais Ltda, Porto Alegre, 2006. S. D. Davis, V. H. Heywood, O. Herrera-Macbryde, J. Vila-Lobos and A. C. Hamilton, “Centres of Plant Diversity—A Guide and Strategy for their Conservation,” The World Wide Fund for Nature (WWF), Gland, 1997. V. N. Clare, I. I. Goncalves and R. Medeiros, “Ocorrência e Distribuição de Unidades de Conservação Municipais no Estado do Rio de Janeiro,” Revista Floresta e Ambiente, Vol. 16, No. 1, 2009, pp. 11 - 22. PIR2 Consultoria Ambiental Ltda, “Linha de Transferência de Água de Formação e Emissário para Escoamento de Efluentes Industriais Tratados do Terminal da Baía de Ilha Grande (TEBIG),” RIMA—Relatório de Impacto Ambiental, Rio de Janeiro, 2009. G. Vazzoler, “A Pesca Marítima no Brasil,” In: B. J. Rothschild, ed., A Pesca: Seus Recursos e Interesses Nacionais, Ibrasa, São Paulo, 1975, pp. 283-297. S. C. Anjos, “Composição, Distribuição e Abundância da Ictiofauna da Baía da Ilha Grande (Rio de Janeiro—Brasil),” Museu Nacional do Rio de Janeiro, Rio de Janeiro, 1993. C. N. Francisco and C. A. V. Oliveira, “Sustentabilidade Hídrica da Região Hidrográfica da Baía da Ilha Grande, RJ,” Anais XIV Simpósio Brasileiro de Sensoriamento Remoto, Natal, 25-30 Abril 2009, pp. 4707-4714. SEBRAE (Serviço Brasileiro de Apoio às Micro e Pequenas Empresas), “Informação Socioeconômica da Cidade de Angra dos Reis,” SEBRAE (Serviço Brasileiro de Apoio às Micro e Pequenas Empresas), São Paulo, 2011. IBGE (Instituto Brasileiro de Geografia e Estatística), “Census 2010,” IBGE, Rio de Janeiro, 2010.